While I plan to model all of the specialized train elements and model complete trains, currently the only train specific elements I've complete are the straight and curved track. I also wrote a perl script which can lay track segments, since the computations involved in positioning track are actually pretty complicated. 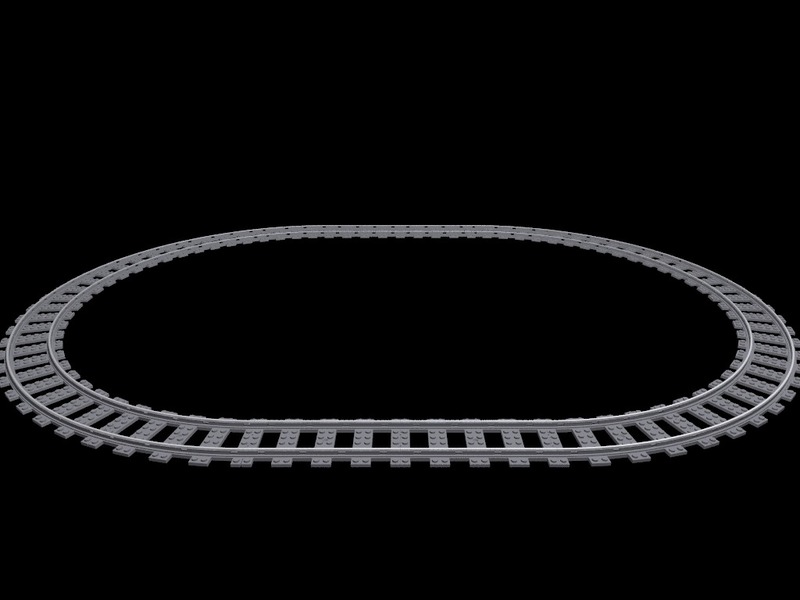 Without switch track, I haven't been inspired to model an amazing switch yard, so the only example I have of a layout is this oval of track composed of two half-circles joined by a few segments of straight track. The layout description is just s 1, l 8, s 2, l 8, s 1. I'm still trying to figure out the easiest way to position completed trains on the track. 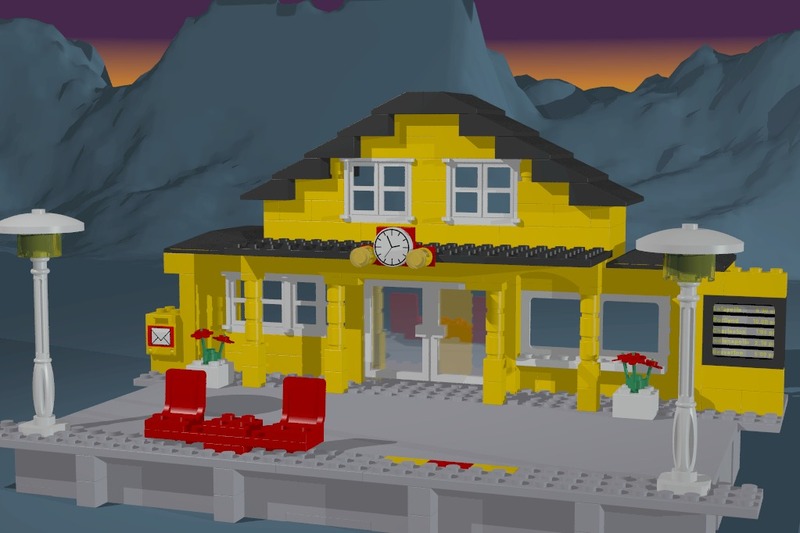 The 4554 Metrostation has been my favorite LEGO building for a long time. My first impression from the catalog was that at $72 it was way too expensive considering its size. After seeing the box at a TRU, I was sold. 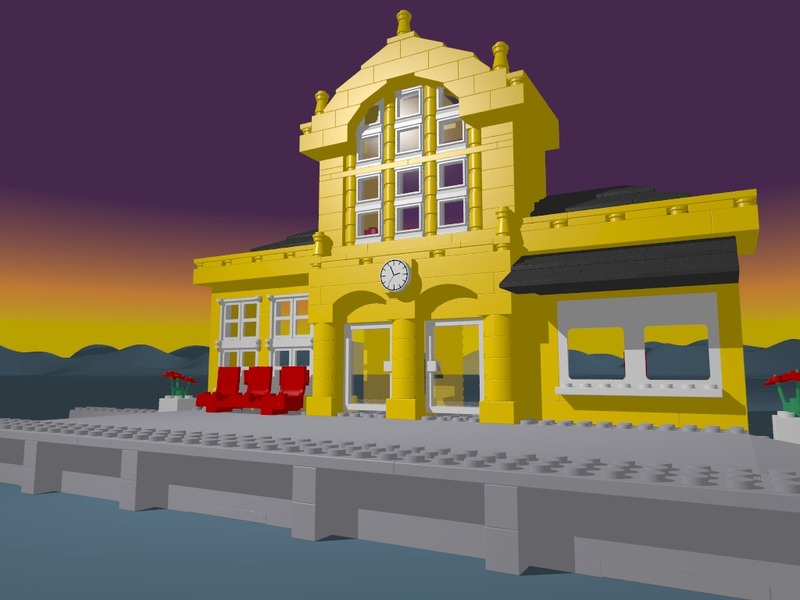 Fortunately I got a job before they were discontinued, and ordered one from S@H. My minifigs can now stand around wondering why their city built a train station but not a train. This rendering is supposed to look something like the front of the box. It's a cross between the actual sunset and hills from the box photo and the distant rolling hills of typical LEGO model photographs. After I got better at making the hills look good up close, I moved them way in, as you can see in the alternate design images. I'm still not satisfied with the lighting in any of these scenes, though, since I only barely avoided casting funny looking shadows on the hills in all of them. When POV-Ray 3.0 comes out, I think I'll experiment with the new radiosity features to fix that. I liked the alternate models pictured on the back of the box so well that I built them all and raytraced them too. This is the small alternate model, which I call the "mini" station. It is actually the last image I completed, so it has more of the detail elements (signs, lamps) that I hadn't completed for the original station. I've left the main model alone to avoid cluttering the foreground, and because I think this station is a better showcase for them. The odd size of the image comes from the aspect ratio of the photograph on the box, which I tried to imitate. I determined later that their actual shot must have had the model in the right side of the frame, and been hand cropped to show only the station, because it's impossible to fill the frame with the station model and still look at it from the same distance and angle as the box photo. I call this version the "Swiss" station, since that's what the A-frame construction reminds me of. My attempt to build this left some room for improvement in the floor of the upper part of the building (I was using only 4554 pieces), but luckily from this angle you can't tell. For those of you who are curious, the cities listed on the schedule I created are Lafayette, Portland, Charleston, Indianapolis and Beaverton. Now that I've finished all of the train stations I plan to do for a while (unless someone sends me instructions for the old station that was around in the 4.5v days) and my partner in crime has completed several of the relevant shirt image maps, I plan to create several scenes with minifigs hanging out at the station, getting into trouble while they wait for their train to arrive.